The excitement and enthusiasm was very high Saturday morning, 20 January. 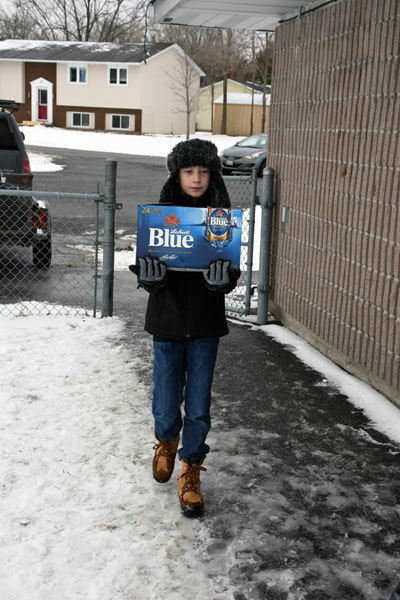 The Youth Group had publicized their Bottle Drive, arranged helpers, and were all set to go. The weather was much more favourable than the week before when the drive had to be postponed due to very cold weather. Today the conditions were nearly perfect. It wasn’t bitterly cold, in fact is was only a few degrees below zero. There was no precipitation, only clouds overhead. The youth started at 9:30 am with three pickup trucks, one towing a large trailer. They initially headed out to cover Coldstream and Dogwood quadrants and Biltmore and knocked on doors. 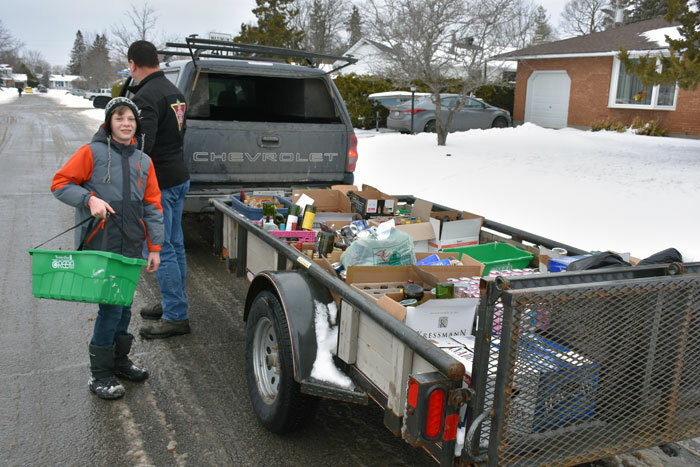 As they were sharing the day and the community with the Richmond Royals Hockey Association, supporters from the Butterfield and Owlshead quadrants could drop off bottles at the Community Centre – the base of operations for receiving and sorting. Duties were split into two operations. The groups on the road canvassed door-to-door asking for and collecting bottles from generous supporters. They carried the donated bottles to the trucks and packed them in it and the trailer. 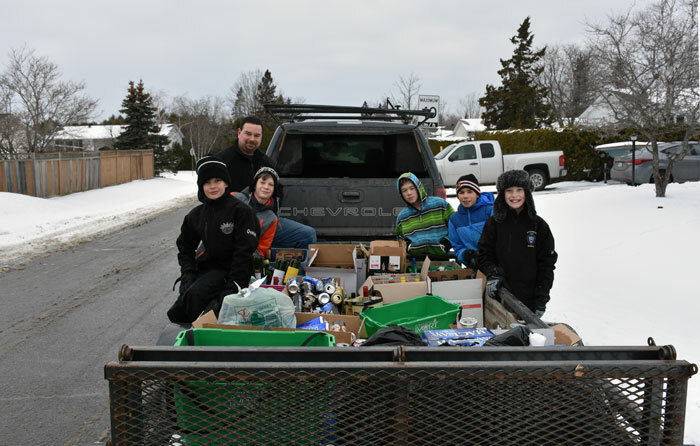 Everyone was eager to cover the area and bring the bottles to the sorting centre. The second operation was at the Community Centre where the balance of the youth and adult helpers received and sorted the bottles and cans for easy transportation and travel to the appropriate refund centre. After the two quadrants in Munster and Biltmore had been canvassed, two trucks headed down Bleeks Road east and west of Munster Road to complete the planned routes. The Youth Group extends a huge thank you for your support. 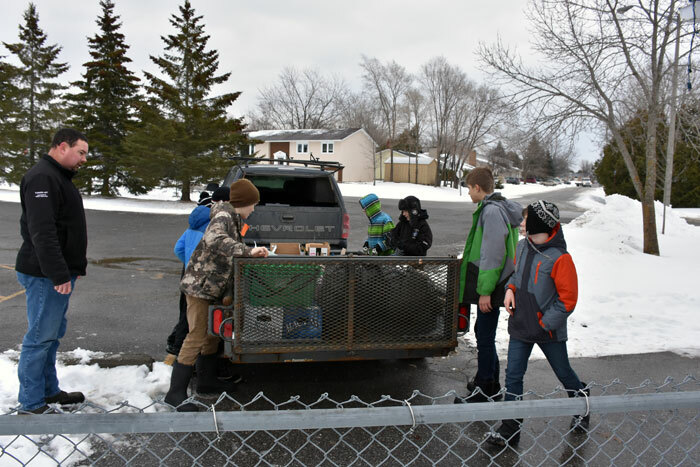 The Youth Group also expresses their thanks to Mr. Bob Easy, parents who provided vehicles and manpower, and to Deb Mallet of Danby’s Restaurant in Munster. Each year the Youth Group undertakes support of a worthy cause. Over the past several years they have undertaken various fundraising activities to support several charities and been proud to raise money for their causes. This year they chose the Big Sky Ranch. The Ranch rehabilitates abused or unwanted animals as well as taking in unwanted animals. They provide quality care for as many animals as their funding allows and they are allowed to do their work through donations and sponsors. We present some photos that we hope captured the spirit and enthusiasm of the moment. Stuffing the trailer with bottles and cans collected. One of two canvassing teams near the end of their route. The large trailer is full! Arriving at the Community Centre sorting station. Starting to unload the bottles and cans for sorting. There were plenty of boxes to carry in thanks to a very supportive community. Boxes of several sizes were filled with bottles thanks to a generous community. A member of the other truck ‘team’ carrying in a box before heading out to cover the Bleeks Road west portion.